We present a novel algorithm for anomaly detection on very large datasets and data streams. Here we propose the Numenta Anomaly Benchmark (NAB), which attempts to provide a controlled and repeatable environment of open-source tools to test and measure anomaly detection algorithms on streaming data. Anomaly detection in supercomputers is a very difficult problem due to the big scale of the systems and the high number of components. 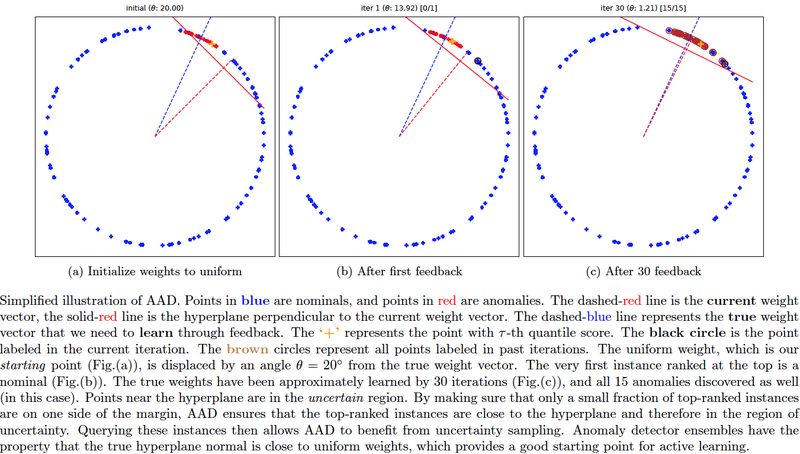 We propose an algorithm called GLAD (GLocalized Anomaly Detection) that allows end-users to retain the use of simple and understandable global anomaly detectors by automatically learning their local relevance to specific data instances using label feedback. First, we present an important insight into how anomaly detector ensembles are naturally suited for active learning. Unfortunately, in realworld applications, this process can be exceedingly difficult for the analyst since a large fraction of high-ranking anomalies are false positives and not interesting from the application perspective. Mechanical devices such as engines, vehicles, aircrafts, etc., are typically instrumented with numerous sensors to capture the behavior and health of the machine.